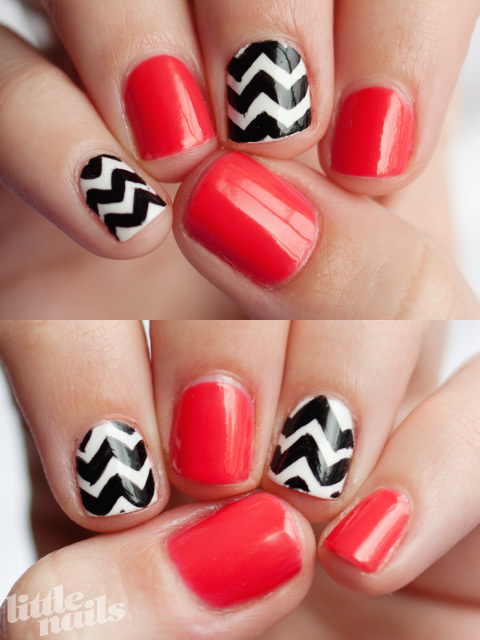 Another chevron mani! I just can't get enough of them! This time I tried my hand at thicker zig zags, and while they're a wobbly on the edges when you inspect them closely, I think they still looked pretty good from a distance. I'll definitely have to practice my corners! The non-zebra nails are painted with ElePhantastic Pink, and then a coat of Mod-ern Girl. I've realised that my nail polish collection is missing a crucial shade of pink - a pink that's not too bright, not too pastel, still pink, but with a hearty splash of coral to it. I was going to use OPI's I Eat Mainely Lobster, but I had my heart set on a lovely creme/jelly and I Eat Mainely Lobster has a delightful shimmer to it. All the pinks I own are either too pale or too red. For the time being, Mod-ern Girl over ElePhantastic Pink will have to do the job. Love this design! The colors look great together too. Definitely going to try replicating this look :) Thanks for sharing!